You can easily change the password for an email account. If you know the password, you are able to change the password through webmail. If you do not know the password, you will need to update the password in the cPanel. Click the Change Password icon. Enter your password in the New Password textbox. Enter the password again in the New Password textbox. You should now see a confirmation page. Congratulations! You've successfully changed your email account's password. Click View Details to the right of the appropriate email account. Type your new password into the Password textbox. Enter your password again in the second Password textbox. 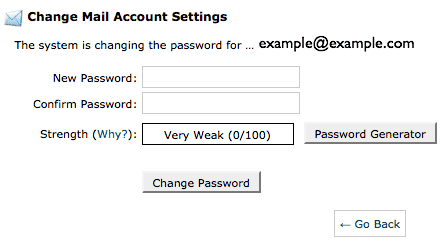 The "Strength Meter" on the page will indicate the difficulty of the password. We highly recommend you use a strong password. Click the Change Password button to set the new password. You should now see Success above the password textbox. Congratulations! You've successfully changed your email account's password.